Learning opportunities you can take part in. An update on our program development. The GTC Resource Library and Journey track are two things that you can use and share with your students (and others) to give them support and structure as they leave school. The GTC Resource library currently has over 170 resources for educators and students that are searchable through filters. This includes resources that include a number of short ASL texts from signers from diverse backgrounds. These texts include both English and Spanish written summaries. We also are breathing new life into some of the grant-produced resources from past RSA projects. Be sure to check out the activities we are creating to engage novice interpreters with the material in ways that take advantage of research on effective learning and practice. This year, we added the GTC Journey track that is open to anyone who is interested in working with resources we develop. Members of the Journey track can use these resources with other Journey track members or independently. To date, we have shared a course on Effective Learning and Practice and an Introduction to the GTC Resource Library in the form of an online scavenger hunt. One of the elements of the GTC program is developing an Individual Development Plan (IDP). In the coming months, we will be releasing a process for doing that with step by step explanations. In creating the process, we developed a sample IDP focused on two competencies that are common challenges for novice interpreters: classifiers and fingerspelled word recognition. This plan provides day by day activities for novice interpreters. The plan is based on work on that incorporates insights from principles of research into effective learning and deliberate practice. It uses the concepts from Taylor (2017,2002) about knowledge-rich and knowledge-lean skills – as well as the concepts of spaced learning and interleaving (Brown, et al., 2014). We invite you to check out the plan as a way to get to know more of what is contained in the GTC Resource library. Your students may also use it independently or as part of a course. 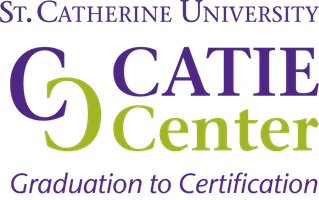 The CATIE Center at St. Catherine University continues its work on the Graduation to Certification program. Last year, our pilot cohort included 14 participants. We also had 14 participants in our comparison group. We are still collecting and analyzing the results of that work including pre and post assessments. In 2019, we are expanding our pilot program to three locations. . Collaborating with three institutions, we have three separate cohorts in the GTC Academic track. The three programs are Rochester Institute of Technology’s Disability Services Apprenticeship program as well as the interpreting programs at St. Catherine University University of North Carolina – Greensboro. Working with other programs is helping us see what components of our program are transferable and sustainable and which need to be adapted. To help with assessing the effectiveness of our program, we have a group of people in the GTC Assessment track who are taking the same pre- and post-assessments as the GTC Academic track (including the new CASLI certification exam.) This track was called the Comparison Group in 2018. The CATIE Center is working with a cohort of five Deaf interpreters in Minnesota to pilot approaches for supporting DIs on their journey to certification. This includes developing a significant number of resources to be available for DI training. Check out the GTC Resource Library as the resources focused on DIs continues to grow. The CATIE Center is planning to offer an online seminar on “Effective Learning and Practice” that will be available at no charge to CIT members as one of our organizational partners. Planned for June 10-22, 2019, the workshop will be asynchronous and will provide a chance for you to engage with GTC resources as well as with other educators about the ways that we can incorporate these resources and approaches in our field. This is also an opportunity for educators to provide feedback to the CATIE Center about these resources and how they may or may not meet the needs of your students/graduates. In the June CIT News, we look forward to having more resources to share with all of you. If you don’t want to wait that long, please keep checking out our GTC Resource Library and sign up for the GTC Journey track. Taylor, M. (2017). Interpretation Skills: English to American Sign Language. Edmonton: Interpreting Consolidated. Taylor, M. (2002). Interpretation Skills: American Sign Language to English. Edmonton: Interpreting Consolidated.